According to a press release issued by the GOB on the same day, the CPP is a roadmap that will outline how to meet the electricity needs of Belize and its consumers over time. The release elaborates that providing access to reliable and affordable electricity is a priority for all parties. It is expected that the CPP will ensure that sustainable options for electricity are pursued optimally combining the efforts of GOB, BEL and PUC. The agreement discussed CPP process which will be guided by the CCI and RMI-CWR, who are neutral parties, and will strive to create an open marketplace for renewable and sustainable energy. Currently, Belize’s power supply comes from Hydropower, biomass, diesel, crude oil and electricity imported from Mexico. BEL meets the country’s peak demand of about 80.6 megawatts, part of which come from the Chalillo, Mollejon, and Vaca hydroelectric dams in western Belize. Another source of hydro energy comes from southern Belize provided via Hydro Maya Limited in the Toledo District. In the north of the country, the Belize Cogeneration Energy Limited provides biomass energy. Belize also gets power from BEL’s gas turbine unit and diesel fired generators. All major load centres are connected to the country’s national electricity system, which in turn is connected to the Mexican electricital grid (Comision Federal de Electricidad) in the Mexican State of Quintana Roo. This power supply from the Mexican side accounts for roughly 50% of Belize’s power supply, which allows BEL to optimize its power supply options. In July of 2016, BEL made public the updated rates Belizeans would be paying for energy over the next four years. The different rates are divided into six main categories. Under the social rates, the price from 0 to 60 Kilowatt per hour (kwhr) are $0.21, with a minimum charge of $3.50. For residential and commercial customers with an average consumption of less than 2,500 kwh, the rates from 0 to 50 kwhr is charged at $0.30 and from 51 to 200 for $0.36, while anything exceeding 200 is charged at $0.40 and the minimum charge overall is $5. For other commercial customers who consume higher amounts of kwh the rates from 0 to 10,000 kwh go for $0.38, while the rate for 10,001 to 20,000 kwh is $0.37. Anything over 20,000 kwh is charged at $0.36, with a service charge of $125. The other two categories deal with two types of industrial customers. Industrial customers not only consume kwh, but a unit of apparent power, which is an electrical power unit known as kilo-volt-ampere (KVA). Under the first category, the demand for KVA is charged at $33, and the kwh at $0.28, with a service charge of $125. The second industrial category, sees the KVA priced at $22, and energy from kwh at $0.24, with a service charge of $125. 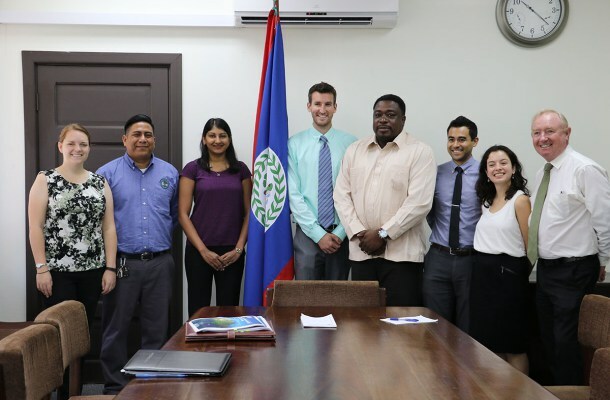 As Belize looks forward to a brighter future in the energy sector beyond 2020, providing sustainable production and distribution of energy, the government has realized that the CPP is a critical step towards that goal. It also aims at minimizing the cost of energy in the local economy, mitigating the impacts of external shocks, all while creating a national culture of energy efficiency.